Walter G. Moss is a professor emeritus of history at Eastern Michigan University and Contributing Editor of HNN. His An Age of Progress?Clashing Twentieth-Century Global Forces (2008), like Pinker’s Enlightenment Now, addresses the question of how much progress has been made in modern times. For a list of all of Moss’s recent books and online publications, click here. There is much to admire in Harvard psychologist Steven Pinker’s Enlightenment Now: The Case for Reason, Science, Humanism, and Progress. During the Trump presidency, which Pinker thinks is disastrous, we need all the optimism we can muster. 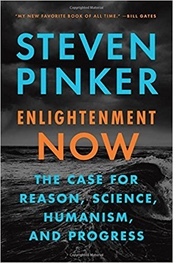 And, as Pinker’s subtitle suggests, he thinks that a strong case can be made for an optimistic, long-term global view. Furthermore, he believes that national pessimism and cynicism helped lead to Trump’s victory. His new book broadens the optimistic argument that he made in his The Better Angels of Our Nature (2011), which maintained that the world was becoming a less violent place. Here he argues that we have also progressed in numerous other ways: “People are getting healthier, richer, safer, and freer, [and] they are also becoming more literate, knowledgeable, and smarter.”  To prove his assertions, he provides (as he did in Better Angels) numerous graphs. To cite just a small sample, “Life expectancy, 1771–2015,” “International inequality, 1820–2013,” “Racist, sexist, and homophobic opinions, US, 1987–2012,” “Literacy, 1475–2010,” and “Leisure time, US, 1965–2015.” Even skeptics will find it difficult to dismiss or minimize Pinker’s overwhelming factual evidence. The case for Enlightenment Now. . . . may be cast as a stirring narrative. . . . The story of human progress is truly heroic. It is glorious. It is uplifting. . . . It is little wonder that Bill Gates, a major contributor to technological progress and subsequently to various important philanthropic causes, considers Pinker such a significant writer. He divides his long book (453 pages, plus another hundred for notes, bibliography, and index) into three parts: “Enlightenment,” Progress,” and “Reason, Science, and Humanism.” Parts I and III each contain three chapters; but Part II spans 17 chapters on topics such as inequality, peace, the environment, and happiness, all of which attempt to demonstrate the overall progress that Pinker believes we have achieved. In some major ways Enlightenment Now is like another recent book by a psychologist, Tom Lombardo’s Future Consciousness: The Path to Purposeful Evolution. Both books are long, stress the importance of evolution, the concept of flourishing, and the importance of believing that humanity can continue to progress toward a happier future. (See here for links to my three-part review of Lombardo’s book.) Both books also stress the necessity of working hard, individually and collectively, to achieve continued progress. They also cite a mind-boggling number of sources and reflect a broad spectrum of knowledge. Despite all the positive elements of Enlightenment Now, including very readable prose, it also has its faults. One is that it undervalues the importance of character virtues, especially wisdom, which it treats too casually. Whereas Lombardo devotes a whole chapter to wisdom and believes that the way we create a better future is “by developing a core set of character virtues, most notably and centrally wisdom,” Pinker makes few statements about wisdom except casual remarks like “the first step toward wisdom is the realization that the laws of the universe don’t care about you. The next is the realization that this does not imply that life is meaningless, because people care about you, and vice versa.” Immediately after contending that higher IQs indicate that we are getting smarter, he makes the mistake of equating “smarter” with more wisdom by saying that “people are putting their . . . wiser lives to good use.”  As Why Smart People Can Be So Stupid (Yale University Press, 2002) indicates, “smart” people are often not wise. General Omar Bradley once said: “Ours is a world of nuclear giants and ethical infants. If we continue to develop our technology without wisdom or prudence, our servant may prove to be our executioner.” He was right in perceiving the centrality of wisdom if we wish to lead the kind of life Pinker extols: a reasoned and humane one that values scientific truth and seeks progress. In general, his whole approach is nicely indicated in his subtitle’s use of the word “case.” He is indeed like a lawyer presenting his case. Only rather than prosecuting or defending a client, he is arguing the “case for Reason, Science, Humanism, and Progress.” What provides evidence for his case is included. What casts doubts upon it is excluded or explained away. For example, he admits that climate change denial and the existence of so many nuclear weapons present the world with “existential threats” (Ch. 19), but he contends that pessimists are too alarmist about their dangers, and that such alarmism does more harm than good. Although troubled by the type of populism that Trump and some other politicians in Europe and elsewhere represent, he asks, “But will Donald Trump (and authoritarian populism more generally) really undo a quarter of a millennium of progress?” He doubts it. But other political observers are not so sanguine. While there is nothing intrinsically wrong with Pinker’s courtroom method of proceeding, we should not mistake it for the ideal, enlightened, open-minded, empirical, scientific approach that Pinker believes the Enlightenment bequeathed to us. Like all the rest of us, he has his biases. Pinker’s approach is the opposite to that of someone who wishes to mobilize all good-willed and open-minded people to work for progress. Dorothy Day, recognized by both President Obama and Pope Francis as a great American, was fond of saying that we should seek “points of agreement and concordance, if possible, rather than the painful differences, religious and political.” Although an ardent Catholic, being considered for sainthood by the Vatican, she often defended her association and dialoguing with communists, anarchists, and non-Catholic religious believers and unbelievers. Pinker is not a concordance-seeker, but a case-maker who makes many good points, but leaves us with reasonable doubts.